In a stockpot with 6 quarts of water, add the chicken, ham hock, onion, garlic bulb (remove 4 cloves for the chile sauce), celery, bay leaves, chile de arbol, peppercorns, and 1 tablespoon of salt. Bring to a boil, reduce to a simmer and cook for 1 1/2 hours or until the chicken is tender. Add the California or guajillo chile to a saucepan and cover with 6 cups of water. Bring to a boil, reduce to a simmer and cook for 20 minutes. Remove from the stove. Take the chicken out of the pot and place onto a baking sheet to cool. Strain the broth, discard the vegetables and ham hock, add 3/4 of the broth back into a Dutch oven pot, and heat to medium. Drain the peppers and transfer to a blender. Add 1 1/2 cups of the remaining broth, 4 cloves of garlic, 1 tablespoon of oregano and the cumin seeds. Blend on high until smooth. Strain through a wire mesh strainer and add to the simmering broth. Remove the bones and skins from chicken, shred the meat and add it to the soup, along with the hominy and 1 tablespoon of oregano. Bring to a boil, reduce to a simmer, taste for salt and continue cooking for 40 minutes. During the last 5 minutes, add the shrimp and cook for just another 5 minutes before removing from the stove. Ladle into bowls and garnish with cabbage, radishes, Serrano chiles, oregano and lemon. Serve with toasted Mexican bolillo bread or tostadas. 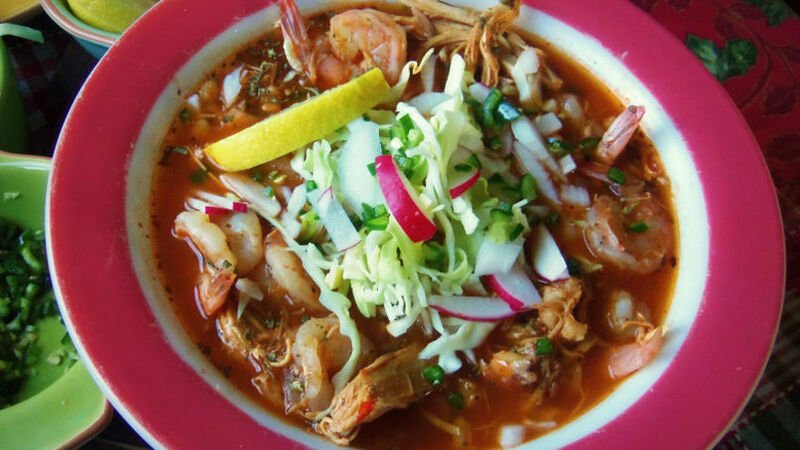 For an even more flavorful pozole, prepare it 2 days before you serve it. The flavors intensify. During the holidays, my family typically gathers to enjoy brunch on Sunday mornings. On the menu is a big pot of Mexican pozole that has spent hours simmering over a low flame. It's warm and inviting, and reminds me of those big family gatherings that lasted all day. For this pozole recipe I added extra vegetables to flavor the broth and also added fresh shrimp, which makes it even tastier.